To launch this unique online slot machine game, a movie quality trailer is shown at the beginning of Paco and the Popping Peppers. It introduces players to the colourful characters and provides them with an intriguing start to their adventure. In keeping with the title of the game, the symbols seen on the reels include red and green peppers, as well as tomatoes, garlic and pineapples. Paco himself stands to the left of the reels and reacts according to the outcome of each spin. Too many losing spins in a row and Paco pulls his sombrero down over his eyes and takes a nap. He comes to life and plays his guitar when winning combinations are achieved, especially when a player scores a big win. This is made easier by the fact that anytime a winning combination of symbols is achieved those symbols drop off the reels and are replaced with new symbols without the need for players to pay for another spin. Every time a winning combination is achieved, players also get treated to a multiplier that increases with every win. The wild symbol in the game is represented by a piñata. The bonus symbol in the game is represented by a hut. When players get three of them on the reels at once they get to experience the Fiesta bonus. It launches a guessing game in which players are asked to choose whether they think the next one to be drawn from a deck of cards is of a lower or higher value than the card that was placed in front of them. Every time a player guesses correctly their winnings are doubled. They get three chances to make their guess, but when they have made three wrong ones the bonus round is over and normal gameplay resumes. Lastly, one of the highlights of this game is its fixed jackpot. In order to win that jackpot, players must be lucky enough to have five of the piñata wild symbol land on a payline that has been activated. If they do, they get to enjoy a generous payout. With a strongly portrayed Mexican theme, Paco and the Popping Peppers is a great way to learn about the country’s culture. It combines a fun experience with an educational one and is popular among players of all ages and in many countries. This game can win over even the most sceptical slot machine players, as when max bets are placed, big wins are frequently achieved. 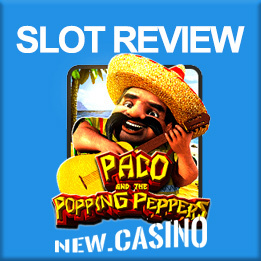 The bonus features of Paco and the Popping Peppers make it an exciting game for experienced players, though players new to slot machines may or may not like it. However, the game has a lot to offer in terms of entertainment value and its interactive nature. The appeal of the game is not lost on those who are looking for something out-of-the-box. Players often enjoy having Paco cheer them on as they spin the reels and test their luck repeatedly.